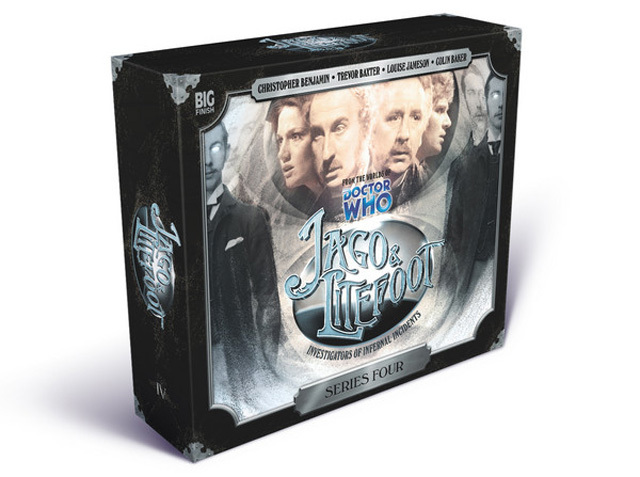 Big Finish: JAGO & LITEFOOT, Series 4 Review | Warped Factor - Words in the Key of Geek. Tony Fyler faces the Dark. Jago & Litefoot, series 4 begins with an odd prospect. We ended Series 3 with the investigators of infernal incident still aided by Fourth Doctor companion Leela, and having just met a shady figure named Professor Claudius Dark, played pretty much like the Victorian Sixth Doctor by Colin Baker. Having had that moment of ‘Who’s this when he’s at home?’ then, it takes us rather by surprise that the first episode of Series 4 mentions it briefly, then whisks Jago & Litefoot off to Victorian Brighton for a spell at the seaside. What’s more, with an episode entitled Jago In Love, Nigel Fairs ensures you can pretty much get the gist of at least one thread in the storytelling. The other strand is some pretty messed-up stuff that makes you ask who you see when you look in the mirror. Do your own eyes look back at you? And can you trust that your friends are really who you think they are? Creepy stuff indeed, which all goes just a little to pot when, as is sometimes the way with Jago & Litefoot, the adventure runs explanation-light, and spirits are real. There’s a chance this could become more than a little waring to mainstream Who-fans weaned on the idea that scary mystical stuff turns out to be scary scientific stuff, merely misinterpreted – Jago & Litefoot often don’t – and in fact, often can’t explain the things they investigate beyond a Victorian level of ‘things beyond the veil.’ What happens to Henry Gordon Jago and his paramour though is genuinely touching and shocking by turns – we tend to think of Jago as having always been the way he is – red-faced, blustering and making his way in the world. It’s rare that the characterization or performance of Jago lets us see a little behind his personal veil of Victorian bluster and into the heart of the lonely man he’s been in his life, so to see it here touches and stings by degrees. Jago in Love also introduces us to another season’s Big Bad – if we’re still asking ‘Who is the mysterious Professor Dark?’ at the end of it, we’re asking ‘Who are the insanely callous Messrs Kempston and Hardwick?’ too. Beautiful Things, by John Dorney, brings Jago & Litefoot face to face with one of the foremost playwrights of the Victorian age. Oh yes, this is Jago & Litefoot and Wilde. It’s rather good fun in its conceits – Litefoot and Leela being less than effusive fans of the man who, to be fair, needed none but himself. Leela in particular is delicious here – Louise Jameson summing up the feeling of many a theatregoer when she delivers the line ‘If I’d had a Janis Thorn, I would have stabbed myself with it.’ And the effect of pitting Wilde in a vocabulary-off with Henry Gordon Jago is a simply sublime succession of sussurating superlatives – a kind of Victorian rap-battle, the winner of which it would be woeful to reveal. But for all the stultifying linguistic gymnastics of his drawing-room plays, people forget that Wilde was also the author of one of the most original and disturbing stories of the Victorian era - a treatise on art, life and morality that stands retelling and retelling as our society grows more at odds with itself. The Picture of Dorian Gray has become so keen a concept – the deferring of impact, the deferring of moral consequence – that people easily forget it was breathtakingly original in its day. Still a bugger to actually read, mind you, but as an idea, breathtaking. And Beautiful Things shies away from the traditional Who route of pitting Oscar against an alien that inspires the story. Instead, the story is already written when Jago, Litefoot and Wilde do battle with a creature with a similarity of nature to Dorian that, if anything, only proves, to Wilde and to us, the validity and varied application of that idea of consequences dodged through the use of avatars. The Lonely Clock, by Matthew Sweet, is this series’ winner of the Sapphire and Steel Award for Creepy Time Shenanigans, here involving a woman who kills her ‘husband,’ and the relatively new-fangled contraption of the London Underground, trapping Jago & Litefoot on board a train with no time, while Ellie, Leela and, as it turns out, the notorious Professor Dark, fight to control the time-twisting shenanigans of Kempston and Hardwick. It’s a piece where the atmosphere is pitched towards high Victorian melodrama, occasionally at the expense of understanding what the blazes is going on. But by the end of it, you’ve sort of got the idea of what exactly has happened, though you honestly have more of a notion of having been put through the emotional wringer on the way to finding out exactly who Professor Dark is and what his agenda might be. The Hourglass Killers by Justin Richards is, if anything, the ‘chase’ episode of this series, Kempston and Hardwick proving to be a properly steampunk pair of foes, beggaring about with the sands of time, trapping people in literal, as well as figurative, hourglasses, and leading our investigators a merry dance to Bedfordshire and beyond (Yes, I know that to a non-UK readership, this will mean absolutely nothing). It’s worth pointing out in passing – because you may miss it, the voice work is that good – that Mr Kempston, throughout this series, is played by none other than Christopher Beeny, from the original Upstairs, Downstairs, and The Hourglass Killers in particular features another impressive vocal performance from Terry (you know who he usually plays) Molloy. It would be a spoiler to reveal the truth about his character here, but it’s categorically true that after the end of The Hourglass Killers, the lives of Jago & Litefoot will never be the same again. Series 4 takes another solid handful of Victorian tropes – bathing at Brighton, the new-fangled Tube, the theatre of Oscar Wilde and his artistic cronies and the steampunk idea of clockwork as a threat to the universe, and gives them what’s becoming a trademark Jago & Litefoot twist. At least a couple of these episodes – Jago In Love and The Lonely Clock – will have you scratching your head along the way to the ending, and The Lonely Clock in particular may still have you scratching your head at the end of it, but taken as a whole, the tone of Jago & Litefoot is solidly stamped on the mind here – as with Series 3, the tone is becoming more and more definite, while retaining an ability to gulp and swallow more of the period into it and give it that Jago & Litefoot note that reminds us of Victorian society itself – explorative, with an openness to science and spirit as equals, and a craving for entertainment and the new. Four series in, Jago & Litefoot show no signs of slowing down – but after this series, it will be fascinating to see what awaits the intrepid Victorians next.